Separating the two best chess players in the world was not easy. Two very different characters. The 27-year-old Norwegian, who came to London as champion, Magnus Carlsen. Fidgety, bored, almost aloof, but fascinating. Across the chess board: the challenger from Brooklyn, Fabiano Caruana. One year younger with dual Italian and American citizenship. He is more upright and studious looking. “Geek-cool”. On first look, chalk and cheese, black and white. But after three weeks locked in battle for the world chess championship, it’s clear they were binded together by the genius. The Special Ones. Carlsen, the highest-rated player in chess history, yet just three measly points clear of Caruana, in a rankings system where both of them have over two thousand points. Both acknowledged as having the brains of “super computers”. And therefore, an unprecedented, world-record, twelve consecutive draws ensued. I had been there at the start, billed as the greatest match-up in chess history. “Are you two making chess cool?” I had asked, as their celebrity is reaching glossy magazines and mainstream media. 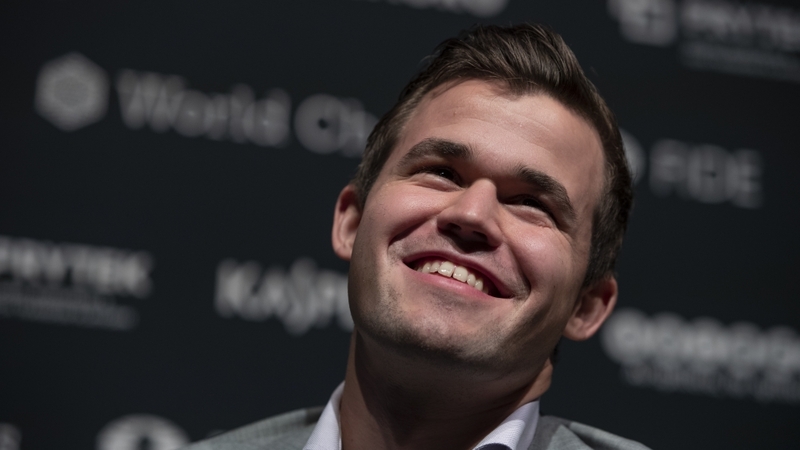 “Chess has always been cool to me, since I was eight years old.” replied Carlsen. Ice-cool and deadpan funny. I returned for Game 12 and was allowed boardside for five incredible, electric minutes. “What if I put them off?” was my fear. But these are two men with superhuman powers of concentration. Planning many moves ahead. With millions of chess fans gripped and in awe, unable to pick a winner for sure. Each game lasting hours with attack and defence, but no winner. Something had to give. But how? Wednesday November 28. “The College”, Holborn, central London. Game day 13. Unlucky for one. Tie-breakers. Four ‘Rapid’ games, then ‘Blitz’ games and if there was still no winner, ‘Armageddon’! The players enter the soundproof box. They shake hands but that’s the last of their eye contact. A couple of hundred spectators, the envy of chess fans, are outside the box in the small auditorium watching the tension unfold. Carlsen, in grey suit, has the first move. He had lit up social media by surprisingly offering a draw from a “winnable position”, but remains the narrow favourite as the first rapid game begins. Caruana, hoping to become the first American world champion since the famous Bobby Fischer over 40 years ago, is in sober blue – another unlikely fashion icon. But would Carlsen’s flair prevail? For an hour, the tension of the rapid game holds. Then that rarest of moments over three memorable weeks in London. A blunder. From Caruana. And Carlson moves in for the kill. Checkmate? A crucial breakthrough, and an explosion of relief had the Norwegian out of his chair, pumping fist. Once ahead, he was not going to let it slip. In rapid Game Two, Caruana was like a boxer dazed from the crucial punch. And by Game Three, it was over, brutally one-sided on the day after weeks of deadlock and tension. This is why Magnus Carlsen is champion, this is why he offered the controversial draw on Monday, this is why he is regarded as the greatest ever on the chessboard. Peter Doggers of Chess.com explains to me how this was the biggest ever match for social media, interactivity and eyes on the board. Over 100,000 people watced the streamed coverage on ‘Twitch’ alone. Chess may not be of interest to all, and free-to-air everywhere, but smartphone games and interest in Asia, where their game originated, have mushroomed. There have been longer, more controversial games, but nothing more intense, more significant, in the growth of a game. Defeat will hurt Caruana, but he will rise to challenge again. And Carlsen isn’t the only winner. This has been a hard-fought victory for the reputation of chess.